Start here! Let our Desk Selector Tool guide you to the standing desk that's right for you. Bring a little zen into your space with our eco-friendly 1" Thick Bamboo Stand Up Desk. 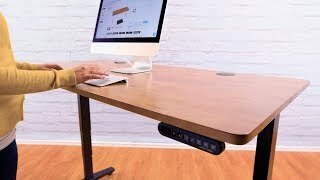 Stand at your current desk with the powerful and customizable E7 Electric Standing Desk Converter. When you need a break from standing, our Pursuit Ergonomic Chair has your back. Great ergonomics, exceptional value. Check out our J3 Ergonomic Chair! Portable, perchable seating is made easy with the E7 Stool. Brighten up your office with the new E7 LED Desk Lamp. Storage and seating in one! Lock your belongings in our 2-Drawer File Cabinet. Don't just stand there! Our E7 Active Anti-Fatigue Mat will transform your standing experience. Designing an office? Let our experts help you plan and build your space. Our online ergonomic assessments will teach you the healthy way to work. Filling out an entire office? We offer bulk discounts for large orders! Learn how standing desks can help you work better and live healthier. Read what our customers have to say about UPLIFT Desk! Calculate your ideal ergonomic measurements with this handy tool. Rubberwood is a light blond colored, medium-density tropical hardwood sourced from the Hevea brasiliensis (scientific name) or Pará rubber tree (common name), usually from trees grown and harvested on rubber plantations. Also known as plantation hardwood, parawood, Hevea, or Malaysian Oak, this lumber is more sustainable for the earth due to its production cycle and the fact that it is utilized for a variety of uses throughout its lengthy lifetime. Rubberwood is environmentally friendly because it's felled at the end of it's lifespan producing latex "sap", and repurposed into furniture like desktops, tables, and chairs, giving it a second life that you get to enjoy! I like your solid and reclaimed wood desktops - are these the same type of wood? Although these desktops made out of genuine rubberwood, which is classified as a hardwood, might look similar to our solid wood desktops, this lumber has a slightly different appearance than our collection of solid wood tops and is denser than our reclaimed wood tops. If you need a desktop that blends strength and beauty, rubberwood is a great choice. How strong is this wood? Rubberwood is rated at 600 - 650 kg/m3 density at (12% m.c). What that means in layman's terms is this: if you need a sturdy desktop that won't warp or break, rubberwood will work for you. The Rubberwood Desktop is crafted from lumber taken from retired Hevea brasiliensis trees. Don't let the name fool you, Rubberwood is an extremely durable lumber that won't bend or warp. The 13/16" thick Rubberwood Desktop is available in a natural, dark brown, or light brown finish. All three finishes feature a subtle wood grain characteristics. The natural finish is the lightest of the three and makes for a soft, eye-pleasing desktop. The light brown finish is a shade darker, while still being a light and refreshing color choice. Dark brown is striking and features darker chocolate tones. Rubberwood desktops are 30" deep and available in the following widths: 48", 60", 72" and 80" wide. Each desktop is 13/16" thick, and the dense quality of Rubberwood makes for a durable desktop that won't warp. We pre-drill grommet holes into our desktops to give you through-desk cable routing that can't be beaten. The grommet holes are located fifteen inches to the left and right from the center of the desktop. This placement allows you to utilize any of our wire management kits to completely conquer your cables. If you are not as worried about wrangling all those wires, you may choose to order your desktop without grommet holes. We give you the option to add wire or power grommets to your desktop. Wire grommets let you route your cords and cables through a swiveling slot that opens and closes on your desk, or upgrade to UPLIFT Power Grommets to add a duo of power outlets to each grommet hole, giving you freedom to power and charge devices straight from your desktop. Grommets are located fifteen inches from the center of the desk, to the left and right. In our ergonomic experience, we've found that this is ideal for the best combination of cable management and accessory use. Desktops are not covered under our 7 year warranty. We will repair or replace any desktop that is rendered unusable as a result of a manufacturer's defect or damage in shipping if notified within 30 days of receipt. For information on UPLIFT Desk warranty coverage, click here. All single-item UPLIFT Desk brand orders, with the exception of our custom laminate and solid wood desktops, are eligible for our 30-day trial. If you're not satisfied for any reason, return the item with no outbound shipping or restocking fees. Return window closes 30 days after receipt of item. You must request the Return Merchandise Authorization (RMA) number within this time. You are responsible for return shipping costs. All items must be disassembled and returned in their original factory packaging and in "Like New" condition. Items not returned in this condition may be subject to additional fees. To view the full return policy, click here. Love our desks, but want more? In most cases, we can offer bulk quantity discounts for orders or smaller purchases placed over time. Bulk deals are based on expected volume and the products you choose. We can also provide you with brochures and swatches to help you in your decisions. To request a quote, contact us via phone (800-531-3746), email (info@upliftdesk.com), or live chat from 8am - 7pm Monday - Friday and from 10am - 6pm Saturday.